When I'm down, one of my favorite pick me up movies is "50 First Dates." It's silly but sweet, and the Hawaiian setting is beautiful. Drew Barrymore's character wears the same simple outfit over and over: a lightweight pair of white pants, pink tee, and flip flops. Ideal for days starting with cool mornings but heating up later on. I don't sew clothing very often because I have a hard time getting a good fit, and there are more and more plus sized petite lines of clothing available. However, I've been looking for a pair of breezy white cotton or linen blend pants for some time, and finally had to take matters into my own hands. To make sure I got a good fit, I used an old pair of well- fitting lounge pants for my pattern. 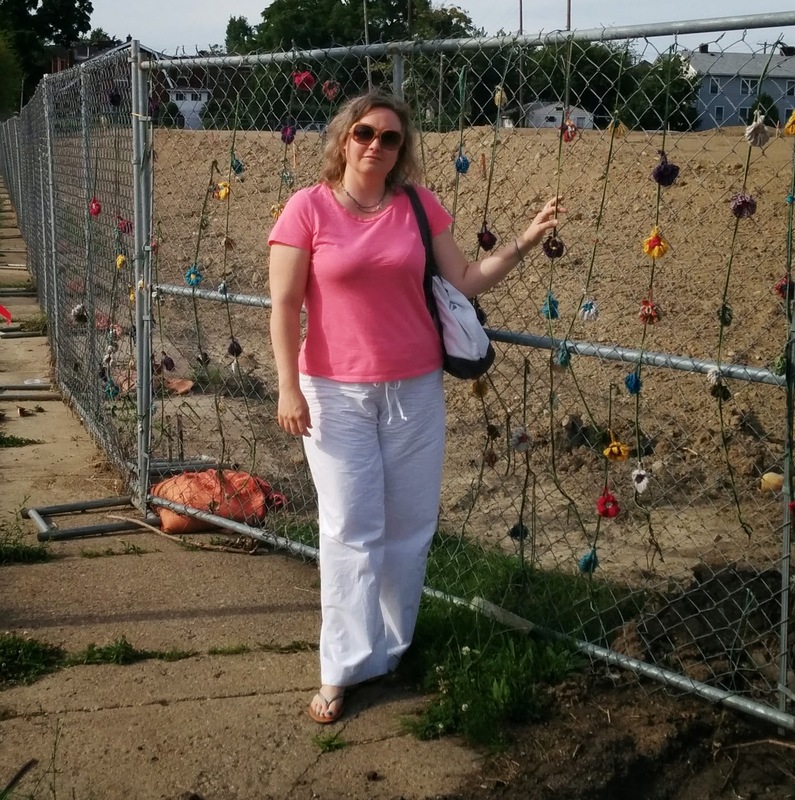 You can find a good tutorial on making a pattern from a favorite garment at Sweet Verbena. She recommends using brown wrapping paper but for smaller sizes or tops you could use tissue paper, or to save money just any large paper or cut open some brown paper bags. I think this method works best for simple garments like pullover tops and drawstring pants. For more complex items, I would buy a cheap pattern for a similar garment, and modify it to match my original garment, that way I would have the sewing directions (or find a good sewing tutorial online first). If you have a much loved but worn out piece of clothing, you can take it apart at the seams and the pieces become your pattern. 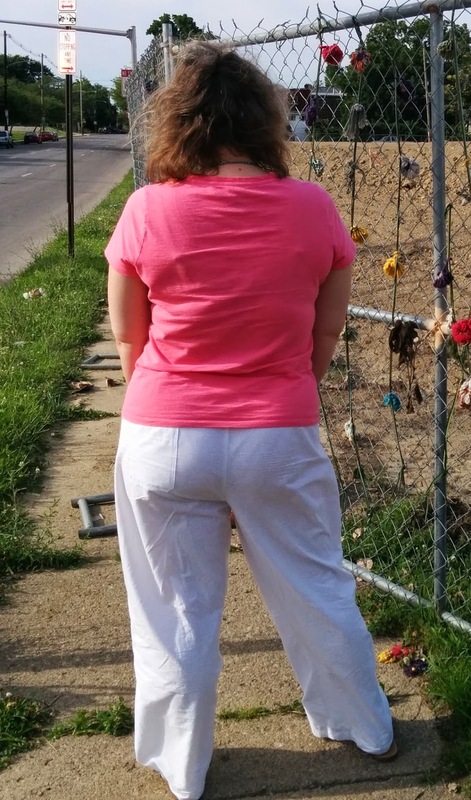 I'm 5'4" and a size 14-16, so I needed three yards of fabric. I bought some white quilter's cotton at JoAnn's (with a coupon of course) for about $9. It has a paisley pattern printed on it in white. I already had white thread, and I made the drawstring and back patch pocket out of leftover fabric. They took about two and a half hours to cut out and sew. I also showed my little brother how to make pants of his own. It was a lot of fun to be sewing again, and we loved how our pants turned out. Ready to stitch up your own pair? There's a free tutorial on Craftsy. The only oversight, in my opinion, is that front and back pieces, especially in bigger sizes, aren't exactly the same. The back pieces are usually a bit wider, with a deeper rise (the seam between your legs from navel to lower back) in back. So when copying your pants, make sure you cut the front pieces as they describe, then switch to the back pieces and cut them separately. 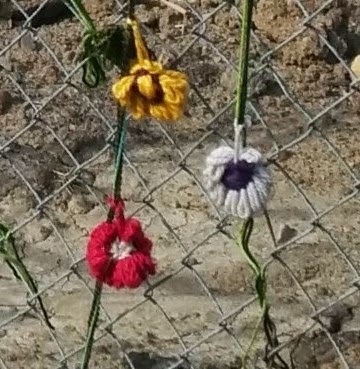 construction site fence had been yarn bombed with dozens of flowers, so it was the perfect photo spot! It's on N. 4th St. between 1st and 5th (in Columbus, OH) if you want to check it out yourself.